Janet comes with an extensive background of how libraries are funded, the troubles they are facing, and ways we can keep this precious resource alive. Come visit her at #Biblionews! For several years, Laurie Norton Moffatt has been thinking and writing about the role of public institutions in creating and fostering community. Moffatt is director of the Norman Rockwell Museum in Stockbridge, Mass., the living repository of works by the iconic American illustrator. His World War II-era drawing of a series of covers for the Saturday Evening Post, “The Four Freedoms,” inspired Norton Moffatt last fall to begin a series of three community town meetings at the museum, to foster “Can We Talk” conversations about important civic topics. She didn’t decide the topics herself, she convened a group of citizens to do so – and they chose three themes: (1) Sickness, Wellness and Social Responsibility, (2) Freedom from Want: Food, Farmers and Families and (3) Four Freedoms for All? A Community Dialogue about Immigration. The events proceeded — as would a New England Town Meeting — respectfully moderated, with any attendee free to step to the microphone and say their piece on the topic. Norton Moffatt will join us at Beyond Books and at an appropriate point she’ll discuss how the “Four Freedoms Forums” worked and how the concept might be adapted by other museums and libraries. The idea for the Four Freedoms Forum was born amidst the strident rhetoric of last year’s political campaign and is rooted in the democratic principles so eloquently expressed in Norman Rockwell’s Four Freedoms. As thoughtful positions about topics important to our nation such as health care, immigration, poverty, energy, the economy, jobs and education became reduced to sound bites and party labels, phrases like The Tea Party and Obama Care, Conservative and Liberal, became code phrases to stand in and substitute for thoughtful discourse about the most pressing topics of our day. Civility became a quaint archaic concept and it became increasingly difficult to learn what the real facts are behind issues of importance to us all. 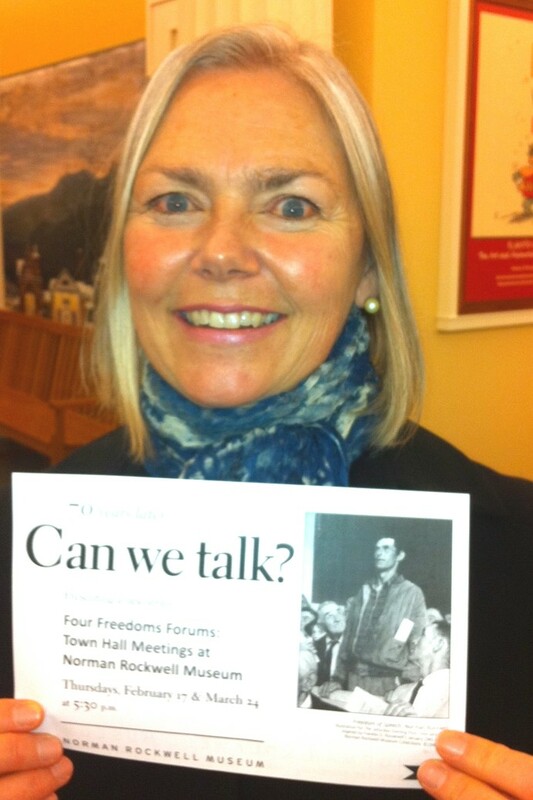 Norman Rockwell Museum Four Freedoms Forums are open to everyone. A non-voting meeting, these conversations do not aim to result in decisions or outcomes, winners or losers. Instead, the goal of the gathering is to engage in polite, respectful dialogue to learn and express a variety of viewpoints about a topic. We hope these meetings will inform us and inspire ongoing civic action on these topics out in the larger community. We hope, too, that the Forum will serve as a model for civil discourse, inspired by the painting hanging behind me, Norman Rockwell’s Freedom of Speech, which depicts a gentleman standing to speak at a Town Meeting, surrounded by respectful listeners, who may or may not agree with the speaker, but who are turned to face and listen respectfully to what he has to say. Dialogue and open inquiry emphasize listening, honesty and open-mindedness. In order to keep our conversation from moving toward an adversarial debate or non-personal discussion, we request that the following guidelines for civil dialogue be observed. ·Please speak in a cordial and considerate manner, and present personal views in a way that invites others to hear without prompting defensive opposition. ·Please do not use the forum to promote your own business or program – bring forward principles that can be applied in broad arena. ·Please listen actively, express your thoughts, and seek opinions freely. ·Please avoid interrupting others when they are speaking and refrain from dominating the conversation. ·Please confront perceived misperceptions without accusation or judgment. Ask open-ended questions to prompt meaningful exchange. ·When there is disagreement, please keep talking to establish potential areas of common ground. ·Please be open to new ways of thinking and feeling, which will inspire true engagement with other participants’ views. ·Please respect confidentiality by refraining from using other people’s names and from sharing others’ personal experiences. Advocacy, the act of pleading or arguing strongly in favor of a certain cause, idea or policy. Debate, a discussion usually focused around two opposing sides and held with the objective of one side prevailing over the other. Negotiation, a discussion intended to produce an agreement. Reciprocity, the active engagement with disparate views rather than exclusively defending one’s own. Active Listening, involving paraphrasing to clarify others’ statements, which is conducive to understanding them. A Search for Common Ground, establishing areas of agreement as a counter to polarization. I will serve as moderator of the meeting. In my role, I and the Museum will remain neutral about a topic, but we encourage you to express facts related to the issue and to offer your personal opinion. In fact, we will consider the Forum a success if there are a wide range of opinions expressed that are conveyed with passion, but without rancor, to which we all listen, and perhaps open our minds and hearts to a broader perspective. We believe our community is hungry for intellectual stimulation and conversation. To select the topics for the meetings, we formed a Citizens’ Council, comprised of a diverse group of community leaders and citizens to select the topics and help generate an audience. I want to thank these citizens for their volunteer time. The experts on the Forum topics are also volunteers from our community, people who have graciously agreed to assist in framing the issues with facts and their expert opinions. Tonight’s topic selected by the Citizens Council is focused on food, farm and families. Tonight we will hear from some farmers, a chef, a farmer’s cooperative and a food pantry. Sustainable agriculture. Food Security. Locally-Sourced food. Hunger and poverty. Nutrition. Health and wellness – Obesity, Diabetes and the run-away cost of health care. The sources of our food, land use and agriculture policy and food affordability. Daily we see headlines in the national and local news on these topics. 12% of the citizens in Berkshire County fall below the Federal poverty level. How does healthy-eating fit into this picture? Last year I viewed the documentary King Corn and learned that for many Americans, their bodies are made of 80% corn! How can that be, two students from Yale wondered, and they set out on an odyssey to see where corn is grown and to try their hand at growing corn in the Farm belt. A year later, they had learned about Federal agriculture policy, the thin margins of survival of farmers, genetically engineered corn, the relationship of the petrochemical industry to farming; corn raised for ethanol, corn-fed beef, high fructose corn syrup, the corn-based nutrition of fast food, the explosion of diabetes and obesity in our nation’s children due to poor nutrition and much more. In 1940, food purchases accounted for approximately 40% of a family budget. Today, thanks for federal agriculture policy, it is about 10%, making food affordable for more people. This is a good thing, right? Or is it, when we learn that the population living in poverty has the worst health statistics and poorest nutrition, thanks to inexpensive, but nutrition-empty food. Fast Food Nation; The Omnivore’s Dilemna; In Defense of Food, authors like Michael Pollen and Barbara Kingsolver, among many others have been writing about food, farming and sustainability, raising public awareness of this essential need for human life. I’m indebted to Michael Pollan, a prolific author about the food movement, who wrote last year for the New York Review of Books about the emerging and merging food movement. Here is an excerpt of his cogent summary. “Cheap food has become an indispensable pillar of the modern economy. But it is no longer an invisible or uncontested one. One of the most interesting social movements to emerge in the last few years is the “food movement,” or perhaps I should say “movements,” since it is unified as yet by little more than the recognition that industrial food production is in need of reform because its social/environmental/public health/animal welfare/gastronomic costs are too high. “As that list suggests, the critics are coming at the issue from a great many different directions. Where many social movements tend to splinter as time goes on, breaking into various factions representing divergent concerns or tactics, the food movement starts out splintered. Among the many threads of advocacy that can be lumped together under that rubric we can include school lunch reform; the campaign for animal rights and welfare; the campaign against genetically modified crops; the rise of organic and locally produced food; efforts to combat obesity and type 2 diabetes; “food sovereignty” (the principle that nations should be allowed to decide their agricultural policies rather than submit to free trade regimes); farm bill reform; food safety regulation; farmland preservation; student organizing around food issues on campus; efforts to promote urban agriculture and ensure that communities have access to healthy food; initiatives to create gardens and cooking classes in schools; farm worker rights; nutrition labeling; feedlot pollution; and the various efforts to regulate food ingredients and marketing, especially to kids. “It’s a big, lumpy tent, and sometimes the various factions beneath it work at cross-purposes. For example, activists working to strengthen federal food safety regulations have recently run afoul of local food advocates, who fear that the burden of new regulation will cripple the current revival of small-farm agriculture. Joel Salatin, the Virginia meat producer and writer who has become a hero to the food movement, fulminates against food safety regulation on libertarian grounds in his Everything I Want to Do Is Illegal: War Stories From the Local Food Front. Hunger activists like Joel Berg, in All You Can Eat: How Hungry Is America?, criticize supporters of “sustainable” agriculture—i.e., producing food in ways that do not harm the environment—for advocating reforms that threaten to raise the cost of food to the poor. Animal rights advocates occasionally pick fights with sustainable meat producers (such as Joel Salatin), as Jonathan Safran Foer does in his recent vegetarian polemic, Eating Animals. “But there are indications that these various voices may be coming together in something that looks more and more like a coherent movement. Many in the animal welfare movement, from PETA to Peter Singer, have come to see that a smaller-scale, more humane animal agriculture is a goal worth fighting for, and surely more attainable than the abolition of meat eating. Stung by charges of elitism, activists for sustainable farming are starting to take seriously the problem of hunger and poverty. They’re promoting schemes and policies to make fresh local food more accessible to the poor, through programs that give vouchers redeemable at farmers’ markets to participants in the Special Supplemental Nutrition Program for Women, Infants, and Children (WIC) and food stamp recipients. Here in the Berkshires, we have lost 20% of our farmland to real estate development during the past decade. Yet our locally grown farm movement is robust, has organized, educated and worked to create a network of farm to table systems that have encouraged local farmers markets, restaurateurs and supermarkets to support local farmers. Plus they grow delicious, nutritious food available in abundance without needing to be flown or shipped across country or around the world. So how does society shape public policy when balancing competing values? Can the Berkshires shape policy that knits food affordability and sustainability on a local level? Our experts tonight will touch on these topics and more. After their introductions, we will turn the conversation over to you for your comments and questions. Opening up public and educational multimedia resources to direct public use is an emerging challenge and opportunity for both librarians and journalists. A unique collaboration between Idaho Public Television and Boston’s WGBH Educational Foundation, will launch in May to do just that with a rich, existing resource. This background was written by Gens Johnson, a Biblionews collaborator in Boise, Idaho. She is working with the public TV station to create “SCOUT,” a web resource which puts a kid-navigable (and library reference navigable) front end on a encyclopedia-like resource of short (a few minutes long) video clips on thousands of educational topics. BELOW: In a 40-minute video, Johnson talks about the BTOP effort and SCOUT. The original resource is called “Teachers’ Domain.” Idaho Public Television, with which Johnson works, will call it “SCOUT.” She’s working with Ted Sicker, executive producer for education projects at WGBH (ted_sicker@wgbh.org ). in most cases), etc. They use a variation of the Dublin Core as their metadata schema (PBCore). front end on the service is designed for teachers, not students. Teachers’ Domain includes professional development stuff for teachers, chat areas, crowdsource rating of the materials, lesson plans, and all that. some level), targeting tagged video and a bunch of other teacher resources at teachers. I emerge from experience in systems engineering, telecommunications, communication theory, university teaching & research, public relations, public broadcasting, multimedia production, political campaigns and IT & project management with the hope that if we can just get the access to information right, we will get the rest of life right?enlightened governance, planetary stewardship, a compassionate society. I want to help with identifying the route for people to find the information that motivates them to do good and makes them efficacious in their endeavors. Metadata lets us give customized access to extant collections and perhaps identify any bias in information. Libraries will still be important portals to information and literature for students, researchers and ordinary people. Most resources will be available on-line but access to information, edited against bias, or carefully curated collections will cost the user. Likewise, to access information while preserving one?s privacy will be impossible, if not through a library collection. The library may have a virtual collection and be a nexus for information pooling. Newsgathering and editing will be done by crowdsourcing that is guided by journalists. The library, physical, where a patron has free and private access, as well as a place for community organization. Here are posting instructions for your interview notes. Share a standout story or quote for each of you. What surprised, challenged, inspired, and/or delighted you about the conversation? As part of conference preparation, we’ve paired participants to start the conversation. The idea is to be in touch with one other person, learn about their expertise, mission and intentions, and then write about it. This gives everyone a head start on the idea-generating process — and a reason to meet someone new. Our main suggestion: to talk about who they are, what they’re doing, and what they hope to get out of the conference. The questions below are stimulus for the conversation. 1. Tell me about your work and how it led to saying “yes” to this confab. What outcomes would you like for yourself and your organization/work from these sessions? 2. The idea of synergy between journalists and librarians is relatively new and provocative. Tell me about an experience you’ve had which points to the potential at the intersection of journalism and libraries. Technology is transforming both institutions, especially in the form of information delivery. As you think about this common ground, what do you see as essential to the relationship between journalists and librarians for serving the public good? 4. Without being humble, what do you value most about yourself? What do you see yourself bringing to this confab? What questions do you hope to answer? 5. The year is 2016. Librarians and journalists have a vibrant relationship that is catalyzing civic engagement in many communities. What’s happening? How does the new environment function: who does what? What is now possible as a result? What steps did we take at this confab and immediately thereafter to bring this about? Welcome to the instruction page for posting the interviews from “catalytic conversations” in advance of “Beyond Books” at MIT. If you find this too complicated, you can always just email your notes to jtm@journalismthatmatters.org and we’ll post them for you. But, to be honest, we’d like you to take the step now of joining the Journalism That Matters online community. You’ll get an activation notice via email. 2. Once activated, log in. 3. 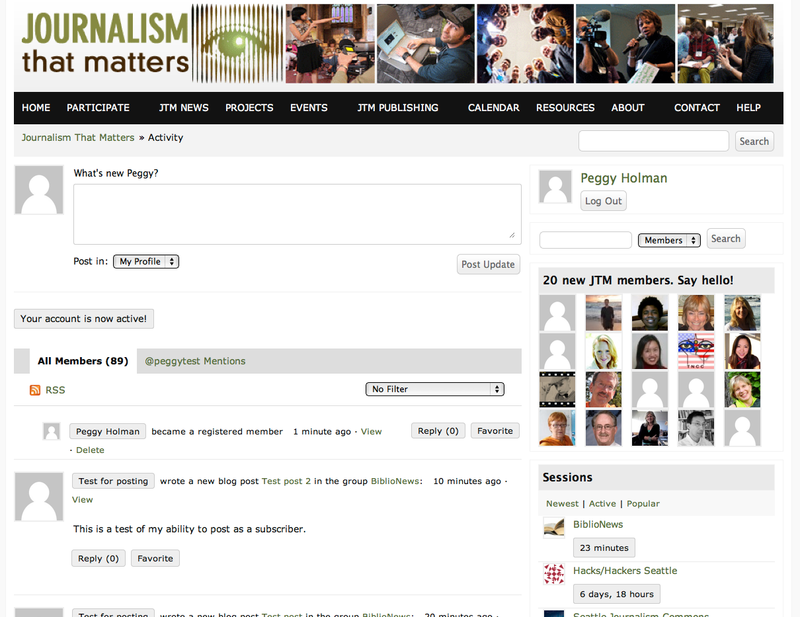 Scroll to groups (on your left) and select BiblioNews. CAMBRIDGE, Mass. – Some 30 partial fellowships, consisting of registration, travel and lodging stipends for graduate students, were awarded to attend “Beyond Books: News, Literacy, Democracy & America’s Libraries,” an unprecedented collaboration of journalists and librarians set for April 6-8 at the MIT Center for Future Civic Media. Funding for most of the fellows resulted from an Institute for Museum & Library Services, with additional support from the American Library Association’s Office for Information Technology Policy and from American Public Media’s Public Insight Network. The two-day, agenda-setting work session and symposium will consider how journalists and librarians can work together to promote civic engagement and open information access. It is designed to amplify the voices of between 90 and 130 librarians, teachers, graduate students, journalists, technologists, scholars and citizens in dialog, discussion and work. “Beyond Books” will inform next steps for designing and implementing a possible national collaborative among, and training for, journalists, libraries and museums on methods for improving open access to public information and civic engagement — consistent with the recommendations of the 2009-2010 report of the Knight Commission on the Information Needs of Communities. (a) Outreach to library and information science thought leaders, especially graduate students, for their participation both onsite and through pre- and post-event virtual proceedings and networking. 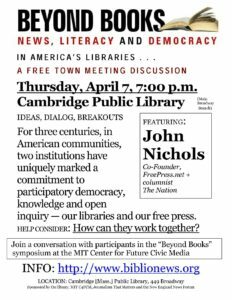 For three centuries — in American towns large and small — two institutions have uniquely marked a commitment to participatory democracy, learning and open inquiry — our libraries and our free press. Today, economic and political realities – or fashions – invite a thoughtful examination of their roles, and the opportunity for collaboration among these two historic community information centers, one largely public, one largely private. 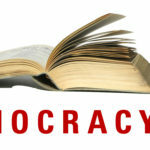 Should librarians be more partisan than reporters? Reporters more partisan than librarians? Libraries and legacy media always shared a common purpose — helping us acquire the information we need to be engaged, informed (and entertained) citizens. But they used different tools — newspapers, broadcast stations and books. Now they all share the web, information technology and increasingly a mission — fostering civic engagement and literacy. As the tools and mission converge, it’s time to ask: “What’s possible at the intersection of libraries and journalism that serves the information needs of communities and democracy?” Help us answer that question . . . and others . . . as JTM convenes its first-ever event in Boston — on April 6-7 at the MIT Center for Future Civic Media in Cambridge. We chose those dates — a Wednesday evening and full day on Thursday — because that’s immediately before the National Conference for Media Reform (NCMR), also in Boston. And you can register once for Beyond Books and be cross-registered to NCMR — for one package price.